Coming from a broken family and raised from the age of 7 by my mother with my brother, I never wanted to be a burden and cause worries or problems. I could see that my mother had enough on her plate; my father, her husband, had left and she had to raise two children by herself. We were living near Paris and our family was based in the East of France. My mum was very much alone. I tried to be helpful and I dealt with the situation by being good and making sure I was nice to everyone. I worked well and hard which was also in my DNA. I didn’t dare make any waves of any kind and I didn’t allow myself to share my needs. I kept them for myself as I knew that some of them couldn’t be met. While working with a psychotherapist for a few years, I asked my mother how she perceived me at that time. She said that during the whole period of separation and divorce, it seemed that I was not affected by the events. The reality was completely different; it affected me a lot but I was clever at hiding my feelings and emotions. I listened to music and lost myself in reading to escape. After I finished my studies, I found my first job. From that point onwards, I evolved in my career and I was doing what was expected from me, even more than was expected… I was motivated and driven. But by what? Now I can say, that at that time, I certainly lacked self-confidence and I wanted to get it from my job, becoming recognised for being excellent in my field. The years flew by; I was working very hard, I earned a good salary, I went on holidays, I had a few hobbies and I spent time with my family & friends. Deep inside me I was yearning for something different. But what? One year I went on holiday with a friend. We were meant to spend two weeks on a Spanish island, spending our time on sporting activities each day. The first week we were there, I had a mountain bike accident and I was taken to Paris for an operation on my collar bone and ligaments. It was my first time ever in a hospital, I had never had anaesthesia before but I was more concerned about being off work for 3 months – I had never taken that kind of time off before. I felt like it was a disaster and I thought I would be bored. The contrary happened. After a month of sleeping a lot, I slowly got my strength back. I loved the time off, between my sessions with my physiotherapist and being at home, I really enjoyed myself. I was surprised that I enjoyed being with myself and letting myself just be. I was always a do-er (even today, I am still learning to just BE). Following this period, I went back to work and the rhythm was crazy again. Life pushes you towards situations from where you can grow… Sometimes we can’t see it when it happens. Back at work, I realised I wasn’t enjoying what I was doing anymore. I could feel my energy being sucked away daily. I felt lost, completely lost… and bored… with no sense of purpose. I regularly had aches and pains. My body was expressing what I was feeling inside! If you’d have met me at the time, you wouldn’t have guessed that I was in such a state. Some people call this period the ‘midlife crisis’. I thought about taking some time off and it took me nearly four years to allow myself to do it. I was nearly forty when I took a sabbatical. It was my time to take some distance with my life, pausing and reconnecting within. I went through a journey of self-discovery and self-development. Helped along by different people, attending workshops and courses. It helped me come back to me. To make some changes, go towards what was important to me, reconnect within, find what I was yearning for, live a life with purpose and take responsibility for it. Through our family, society and school we are conditioned to live our life in a certain way. We follow paths to please others. Are we really who we are? Or have we hidden or suppressed our true personality? Do we see the world with our own eyes, or with the views of others? We are all different. Some people are happy to just fit in, to not stick out, but it is also great to accept and allow that it doesn’t suit everyone. In that case, midlife is a huge opportunity to become who you are and live on your own terms and your own way. 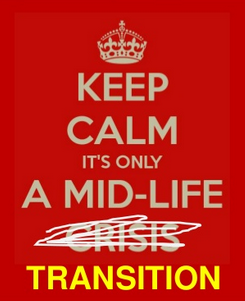 In your midlife, you can face a crisis at work or in your life in general. It can be triggered by children fledging the nest, health issues, losing someone close, divorce or changes at work… The outcome is the same; feeling empty, stuck and demotivated. Or overwhelmed. The loss of sense and purpose, the feeling of not knowing who you are anymore and that nobody understands you. Having the sense that there must be more, or that something is missing. The good news is that this period is full of opportunities and possibilities. I was there, and I really know how it feels. Working together means learning to connect to your inner resources to create a beautiful, meaningful and productive life.